The Rebel Sweetheart. 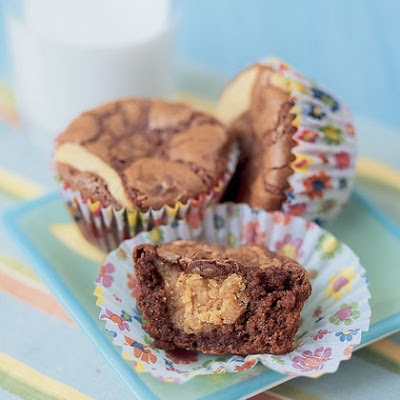 : Foodie Goodie | Peanut Butter Cup Brownies. Sorry for the lack of updates. It's been a crazy, stressful week at school (my little man's school, to be exact) and I just was not in the mood to write for the past couple of days. I'm thankful for the weekend - time off from school, and I get two days to rest at home, update my blog, do the laundry, and watch my favorite Kdramas. 1. Line 18 to 20 cups of a standard muffin tin with bake cups. 2. Combine the filling ingredients in a medium-size bowl and beat them with an electric mixer until evenly blended. The texture should be like whipped peanut butter. If it's not stiff enough, add some more peanut butter. 3. Fill each muffin cup about halfway with brownie batter. 4. Spoon about 2 teaspoons of peanut butter filling into the center, pushing it down slightly into the batter. 5. 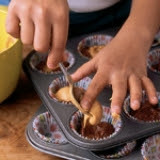 Cover the filling with another spoonful of batter, making sure that the cups are no more than about two thirds to three quarters full. 6. Bake for 15 to 17 minutes, just until well risen and cracked on top. 7. Transfer the pans to a wire rack and cool for 30 minutes. 8. Remove the brownies from the pan and place them directly on the wire rack. Allow them to cool before serving. My son loves peanut butter kasi. another recipe to follow since we love peanuty butter and cream cheese together sounds really yummy! Brownies....always love to try this out.thanks for sharing. homahgosh that looooks yummy!!! I love peanut butter.. wahaha. Goodbye diet. LOL! I'm going to try this recipe because lately I've been craving for sweets! I love the taste of peanut butter so I'm sire to love this brownies. The only thing I can bake:P if you call it baking is brownies I will try this one out! Thanks for sharing! Lovin me some peanut butter! I grew up with it, and can't imagine life without it. So now... gotta try this recipe - it looks delicious! This looks sooooo good! I love peanut butter too, as well as brownies so this is a nice way to combine both :D Will try this soon, and will try this with cookie butter spread too and nutella. These are really looking super delicious! !